Bring Back This Series: The Adventures of Brisco County Jr. Most people were introduced to geek god Bruce "the Chin" Campbell via the Evil Dead series. It's still his most iconic role to this day. However, my introduction to him was through a little weird western show called The Adventures of Brisco County Jr. It's a show I still have fond memories of, and one that I think is ripe for revival. Set in 1893, the series follows Campbell's Brisco County, Jr., a bounty hunter and son of a famed US Marshall. His father (played by R. Lee Ermey) is murdered in the pilot episode while transporting the infamous outlaw John Bly and much of his gang. The gang escapes, starting Brisco's mission to recapture the gang and bring Bly to justice for his father's death. Brisco is added by multiple allies, including rival turned partner Lord Bowler, lawyer Socrates Poole, con artist/saloon singer Dixie Cousins and eccentric inventor Professor Wickwire. It sounds like a pretty straightforward western, but Brisco County Jr. was far from that. Also in the pilot episode, a mysterious and powerful Orb was discovered, which effected everyone that encountered it differently. The Orb turned out to be a piece of far future technology, and Bly himself turned out to be a time traveller also from the far future who intended to use the Orb to rule the world. Professor Wickwire, played by the legendary John Astin, was another reason the series falls more into the "weird west" genre. The good professor often aided Brisco with various anachronistic gadgets, such as a rocket train, motorcycle and zepplin. If the Orb plot wasn't a part of the series, it would fall firmly into the steampunk genre, for certain. I was ten when this show premiered and I LOVED IT. It was just plain fun, with a great sense of humor. Campbell was a charismatic lead, and had a great cast surrounding him, including Astin, Julius Carry as Bowler, Christian Clemenson as Socrates, and Kelly Rutherford as Dixie. The story was exciting, and always weird. Even the episodes which were straight western were slightly off-kilter, thanks to Campbell and his fantastic co-stars. The writing staff was great, who all went on to various genre TV credits, including EP Carlton Cuse (Lost, Bates Motel), John Wirth (The Cape, V, Sarah Connor Chronicles), Brad Kern (Charmed), and David Simkins (Warehouse 13, Dark Angel). I'm a firm believer that the Western genre in general deserves another chance, and every year around pilot season, I get excited every time I hear of a Western pilot. Inevitably, it doesn't happen though. Revolution was the closest we've come to a western on network TV for years, and it really wasn't that close to feeling like a western. Brisco has a cult following though, fertile creative ground, and a charismatic lead. Could a sequel series mine the concept? I think so. 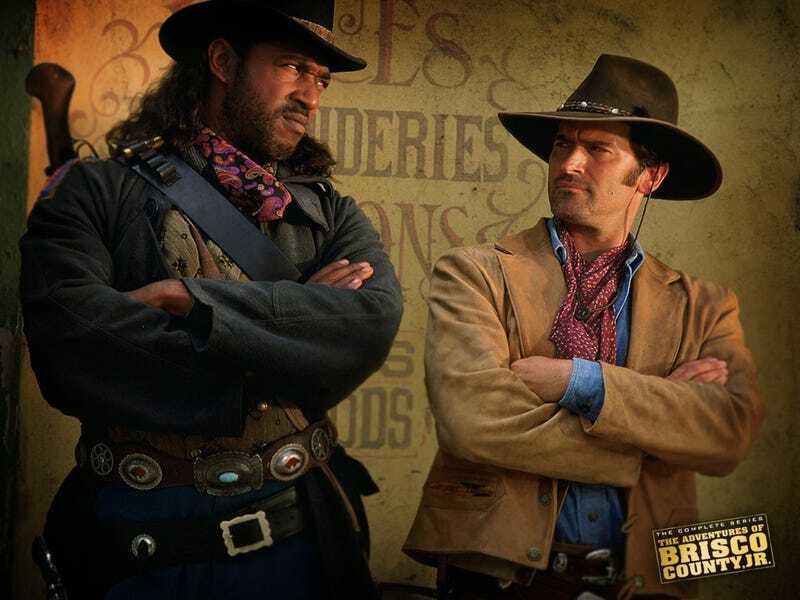 It's been twenty-two years since the series aired, and that's the perfect amount of time for a young Brisco County the Third to have grown up in his father's tutelage, and for the duo to begin hunting outlaws at the turn of century.